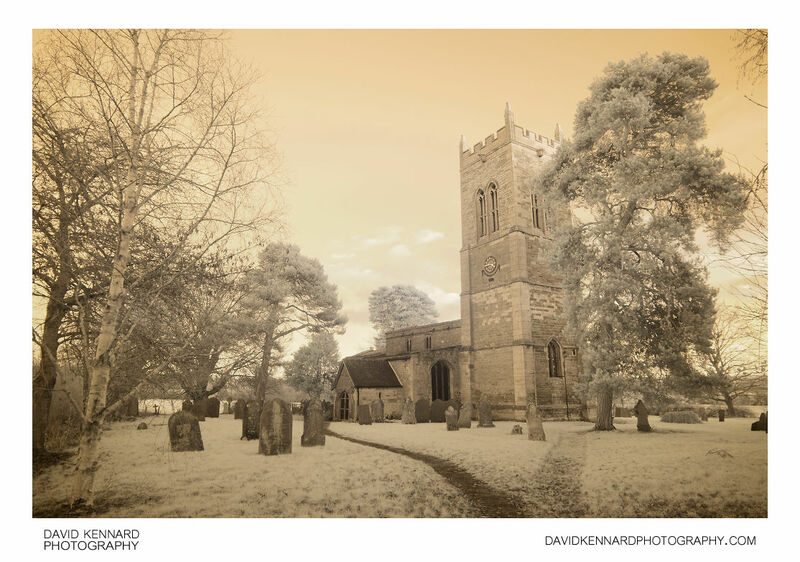 False colour infrared photo of St. Nicholas Church in Marston Trussell, Northamptonshire, UK. The church dates from the 13th century, though has been significantly modified since then. The tower dates from the mid 16th century. Like most churches, the church building is surrounded with a graveyard. Taken in winter, this photo shows most of the trees lacking leaves, but there are several pine trees with all their foliage visible. The most significant is a large tree located quite close the church's tower, and actually being taller than the tower. Grass and foliage reflect quite a bit of infrared light, and so the pine trees and grass appear brighter than they would in a normal visible light photograph.